Mass customisation; it sounds like an oxymoron, but is the latest trend in packaging after Coke blazed a trail with its ‘Share a Coke’ campaign. 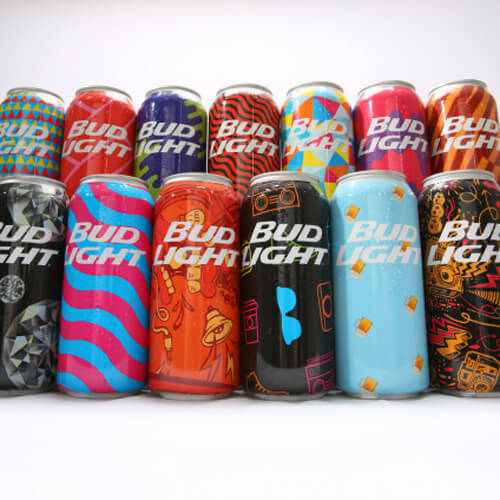 Now Bud Light has jumped on the bandwagon in the USA with a special edition of 200,000 Bud Light cans, designed to appeal to music festival goers. And in the UK Mars brand Snickers has introduced a clever twist with its ‘You’re Not You When You’re Hungry’ campaign. It features a range of 21 different wrappers representing a different ‘symptom’ of hunger. Goofball, Drama Mama, Princess, Curmudgeon, Cranky, Irritable and Confused are among the labels that will appear on the packaging. Will Herman of Pelican Communication’s packaging team commented: ‘Both brands are tapping into the millennial generation’s desire for personalised, yet shareable, experiences. Herman added: ‘Both of these campaigns are excellent examples of how brands are utilising the full potential of packaging to augment and personalise the brand experience. The increased customer engagement is likely to generate long-term brand loyalty and drive sales. For those of a technical bent, Anheuser-Busch, says the labels for its Bud Light cans were printed using an HP Indigo WS6800 Digital Press and HP SmartStream Mosaic design software. Bud Light is purportedly the first brand in the United States to use HP SmartStream Mosaic for mass-customised packaging. According to HP, the software manipulated 31 custom label designs to create a range of more than 31 million potential shrink-sleeve designs. From these came the final 200,000.